The gorgeous alpine scenery of Land Salzburg will be familiar to anyone who has seen "The Sound of Music." Imposing mountains, rugged valleys, rolling foothills, striking waterfalls, freshwater lakes, and clear blue skies make for one of the most alluring landscapes in Central Europe. The province has an alpine climate, though slightly more temperate. The weather can be very unpredictable, experiencing extreme swings of temperature. Summers are wet and humid, while winters are freezing. In any season, you can expect frequent and heavy rainfall. Austria's highest mountain, the Hohe Tauern, runs through Land Salzburg in the south. It is the setting for the National Park Hohe Tauern, the biggest nature reserve within the Alps. A place of stunning mountain views, massive glaciers, and dramatic waterfalls, the park offers a largely unspoilt wilderness to explore and see alpine flora and fauna, such as marmots and ibexes. Land Salzburg is skiing country, with an impressive concentration of world-class ski resorts: Zell am See, Kaprun, Flachau, Abtenau, Maria Alm, and Saalbach-Hinterglemm are among the most popular. The province also has many charming alpine villages, such as Saalfelden. 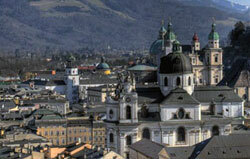 The provincial capital is Salzburg, the city of Mozart, who was born here in 1756. The composer is highly celebrated with museums, a concert hall, and the annual summer Salzburg Festival, which showcases Mozart's music. The fourth-largest city in Austria, Salzburg is a romantic, culture-laden city set against a stunning alpine vista. Famed for its rich Baroque heritage, Salzburg is an excellent place to see architectural marvels such as Salzburg Cathedral, Hohensalzburg Fortress, and the Schloss Leopoldskron and Schloss Hellbrunn palaces. Salzburg's old town, decorated with charming 17th- and 18th-century houses, has something of a fairytale atmosphere. The old town is a UNESCO World Cultural Heritage site. Salzburg abounds in parks and gardens. Most notable among these are the Mirabell Gardens, the extraordinarily beautiful Baroque gardens that form the grounds of the Mirabell Palace. The area around the Mirabell Palace is popular with real estate buyers, and rather expensive. The Getreidegasse neighborhood is another a prime property area. 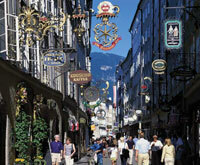 The Getreidegasse is the street where Mozart was born, and today it is an attractive shopping lane. Property prices here are very high; this is the most expensive area in which to buy real estate in Salzburg. Also an in-demand residential area: the Linzergasse, a street of small craftsmen and merchants that is similar to Getreidegasse, only less cosmopolitan. If you're interested in buying a period residence, look around the Residenzplatz and the Kapitelplatz areas close to the Hohensalzburg Fortress. For a prime residential area with a pretty mountain view, check out the Salzburg Parsch suburb that lies at the foot of the Gaisberg mountain. Outside the city, the ski resort villages of Maria Alm, Flachau, and St. Johann have good options to offer apartment hunters, and each of these villages is only about an hour's drive away from Salzburg. The American International School (AIS), a preparatory boarding school for international students, is located in Salzburg.